Welcome to our Fun with Math & Science Online Game. This quest is designed to introduce you and your preschool child to wonderful online resources to strengthen math, science, and reasoning skills. You are encouraged to click on as many of the game squares as you can, but don’t feel like you need to explore each and every one! The most important thing is to have fun and spend time exploring with your child. Each website you visit will have many other fun and educational activities – explore them when you have the time! Looking for more adventure? 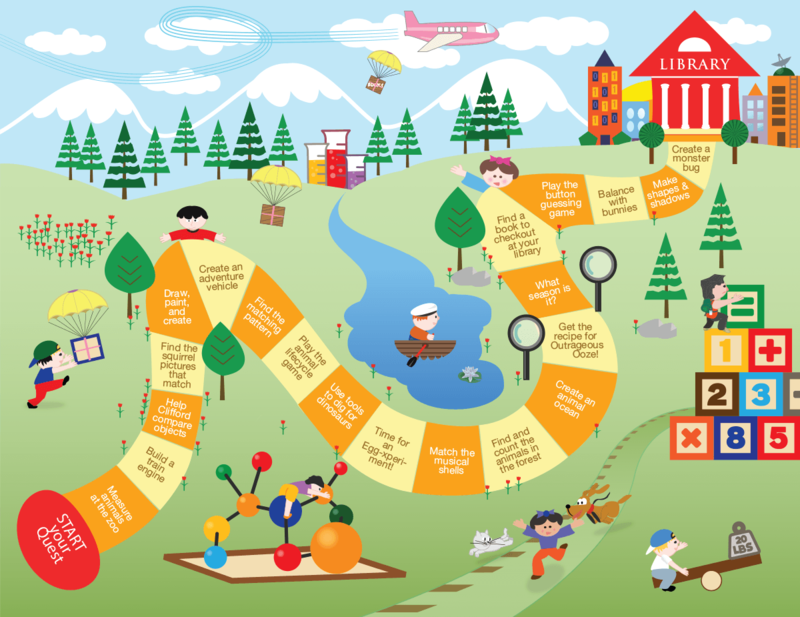 Explore the picture and find hidden links to other fun activities! Keep online play sessions brief. Young children don’t have long attention spans, so when they start getting antsy, it’s good to take a break. Talk with your child as you explore. Explain what you are doing and ask lots of questions. Let your child practice using the mouse during the play session. This helps him/her build fine motor skills. Remember that math and science can be incorporated into everyday activities. A nature walk or romp in the yard is a great time to talk about the world around them! Let your little one cook with you whenever possible. Cooking is a great time to practice math and science skills! Point out shapes and numbers when you are in the community. Let your child help you sort the laundry; matching socks helps develop math skills. So, snuggle up at the computer with your child and start your quest! Thank you for playing our online quest with your child! Please take a moment to fill out a short survey about your experience and we will send you a free book.